Designer solutions for desk-side disposal. These wastebaskets make an elegant addition to any office. 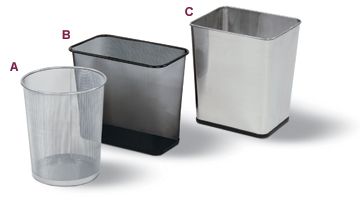 (A and B) Stylish sturdy lightweight Mesh Wastebaskets with a solid steel base feature a "no-snag" curled rim and durable baked-on epoxy finish. The round mesh wastebaskets are sold in cartons of 6 and the rectangular mesh wastebaskets are sold in cartons of 3. (C) Sleek heavy-gauge satin-finish fire-resistant Stainless Wastebasket. Will not burn melt or emit toxic fumes. Vinyl base ring protects floors and carpeting. Sold in cartons of 3 only.